Here you will find information our repeaters, monthly club meetings, board meetings, memberships, general contact information and activities. Including our SuperFest Website information. 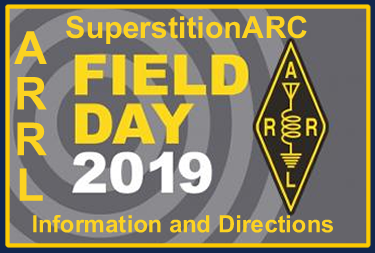 The Superstition Amateur Radio Club has something for everyone - whatever your amateur radio interests are, you will find someone in the club to exchange ideas with, learn from, and or teach someone something new. Whether you want to learn CW (Morse code) and work other continents. Build and tune your own antennas, climb mountains and talk to other people around the world with portable equipment with Summits On The Air (SOTA). How about helping others build an Amateur Radio Emergency Data Network using 2.4 GHz , 3.3 GHz and or 5.8 GHz microwave nodes here in Mesa and the surrounding communities. Not only is it a lot of fun to build, you will be able to help out in case of an emergency with the services that you can help provide. Are on the third Tuesday of the month except December and the location is the Charles K. Luster located at 640 N. Mesa Drive, in Mesa, just north of University Dr. The meetings start at 7:00 PM and are usually over around 9:00 PM. If you’d like to help out with this year’s event, the SuperFest committee meets monthly except for December just before the general meeting. The meetings run from; 6:10 to 6:45 pm. Contact the SuperFest Committee Chairman if have any questions. Field Day 2019 Information and directions. Business owners, become a sponsor of the Superstition Amateur Radio Club. Your sponsorship will help us continue to grow and expand our services for the community including Emergency Communications. Earn AmazonSmile Donations for the Superstition Amateur Radio Club while you shop for Gifts for your Family and Friends. 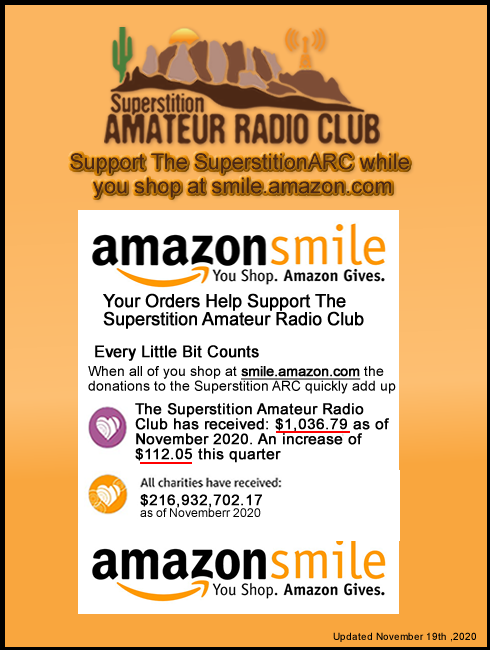 Support the Superstition Amateur Radio Club by starting your shopping at smile.amazon.com. 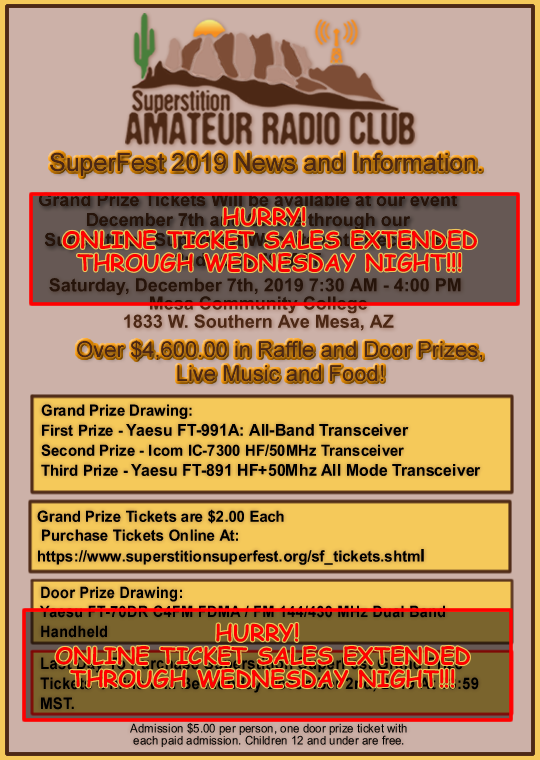 Listen to members of the Superstition Amateur Radio Club on the November 25th, 2019 show. We would like to thank JD Smaylis KF7VOX the host of the Article Five Hour for this show that was on Sunday afternoon on 1100 KFNX from 4:00 to 5:00 pm. John WX4LTG gave his presentation on lightning protection while outdoors and how to stay safe. Your independent source of Amateur Radio news for today's radio amateur. You can now listen to Amateur Radio NewsLine any time that is convenient for you and is usually updated on Friday of each week. Dale N7QJK has been working on needed changes and edits on superstitionarc.org site. The menu has been edited to remove the drop downs that didn't play well with Apple Products, he also changed the look of the menu. On the pages for the Communicator Newsletter was edited and moved everything to a single page. The Contact Us page and Contact page for the Officers and Board members were combined in to one page. The Club History page and the About US information was also combined together as one page alone with the Constitution and By-Laws. The footer section was also edited and a small menu was added for the Home, About Us, Contact Us and Membership pages. On the Membership page, Dale reports, that Ham Club Online - Amateur Radio Club Management System is now online. Thanks to Douglas W7ADD for getting this setup and running. It will make renewing your membership or joining the club so much easier. Douglas is also working on some edits and additions to take care of a couple of errors that occurred during the process to join or renew your club membership. The Officers and Board members would like to thank Dale for all of his hard work and the time he puts into keeping our website's looking good and working so well. We all hope the changes will help get clubs news and information out to the visitors of our website's than how it had been in the past. Have an idea for an news article, or something you would like to submit for publication? Then use the link below and send it to Dave Muller - K7AV. We can always use articles and photos each month. So help Dave out and submit something today. John Wolven KG7NSP SuperFest Chairman, Announced at the March Meeting the list of Prizes for our 2019 event. They have been ordered and have arrived along with the 2019 Raffle Tickets. We submitted the event to ARRL and have been approved as a Sanctioned Event and are working on the letter to ARCA for the event as well. At the Falcon Field event we started selling 2019 Raffle tickets and did pretty good. At the April meeting we will start working on bids and contracts the tables, chairs and porta jons. Along with contacting the companies from last year who donated some pretty fantastic prizes. Dan KC7MSU is working on a redesign for the 2019 flyer and will be getting that posted as soon as it's done.